New! Free continuing education from MMWR and Medscape: "Prevention and Control of Seasonal Influenza with Vaccines: Recommendations of the Advisory Committee on Immunization Practices—United States, 2018–19 Influenza Season"
CDC published Update: Recommendations of the Advisory Committee on Immunization Practices for Use of Hepatitis A Vaccine for Postexposure Prophylaxis and for Preexposure Prophylaxis for International Travel in the November 2 issue of MMWR (pages 1216–1220). The first paragraph is reprinted below. Postexposure prophylaxis (PEP) with hepatitis A (HepA) vaccine or immune globulin (IG) effectively prevents infection with hepatitis A virus (HAV) when administered within 2 weeks of exposure. Preexposure prophylaxis against HAV infection through the administration of HepA vaccine or IG provides protection for unvaccinated persons traveling to or working in countries that have high or intermediate HAV endemicity. The Advisory Committee on Immunization Practices (ACIP) Hepatitis Vaccines Work Group conducted a systematic review of the evidence for administering vaccine for PEP to persons aged >40 years and reviewed the HepA vaccine efficacy and safety in infants and the benefits of protection against HAV before international travel. The February 21, 2018, ACIP recommendations update and supersede previous ACIP recommendations for HepA vaccine for PEP and for international travel. Current recommendations include that HepA vaccine should be administered to all persons aged ≥12 months for PEP. In addition to HepA vaccine, IG may be administered to persons aged >40 years depending on the provider’s risk assessment. ACIP also recommended that HepA vaccine be administered to infants aged 6–11 months traveling outside the United States when protection against HAV is recommended. The travel-related dose for infants aged 6–11 months should not be counted toward the routine 2-dose series. The dosage of IG has been updated where applicable (0.1 mL/kg). HepA vaccine for PEP provides advantages over IG, including induction of active immunity, longer duration of protection, ease of administration, and greater acceptability and availability. The American Dental Association (ADA) adopted a new policy on HPV vaccination for the prevention of oral HPV infection. Portions of the press release are reprinted below. With the number of cases of HPV-associated cancers on the rise, the American Dental Association (ADA) has adopted a policy that urges dentists to support the use and administration of the human papillomavirus (HPV) vaccine. The combined estimate by the American Cancer Society is that there will be more than 50,000 new cases of oral and oropharyngeal cancers in 2018, of which 70 to 80 percent will be attributable to HPV. The HPV vaccine could help prevent the vast majority of the oropharyngeal cases, but compared to other vaccines in the U.S., it is underutilized. According to the ADA Council on Scientific Affairs, the single best predictor of whether a young person or adolescent receives the vaccine is a recommendation from a trusted health care professional. CDC published Hepatitis A Virus Outbreaks Associated with Drug Use and Homelessness — California, Kentucky, Michigan, and Utah, 2017 in the November 2 issue of MMWR (pages 1208–1210). The first paragraph is reprinted below. 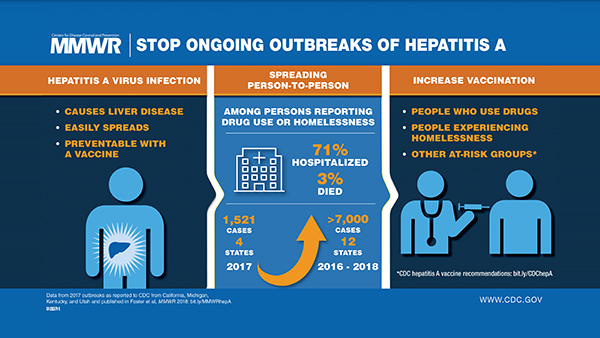 During 2017, CDC received 1,521 reports of acute hepatitis A virus (HAV) infections from California, Kentucky, Michigan, and Utah; the majority of infections were among persons reporting injection or noninjection drug use or homelessness. Investigations conducted by local and state health departments indicated that direct person-to-person transmission of HAV infections was occurring, differing from other recent, large HAV outbreaks attributed to consumption of contaminated commercial food products. Outbreaks with direct HAV transmission among persons reporting drug use or homelessness signals a shift in HAV infection epidemiology in the United States, and vaccination of these populations at high risk can prevent future outbreaks. If you vaccinate adults in your practice, be sure to check out IAC's Vaccinating Adults: A Step-by-Step Guide (Guide) web page if you haven't already. The 142-page Guide was totally updated in late 2017, when it was made available in print and as a free downloadable copy. The original 5,000 print copies were soon gone, but the book continues to be available as a free download at www.immunize.org/guide. Between November 2017 and September 2018, users downloaded over 8,700 complete copies of the book and more than 22,000 individual chapters. 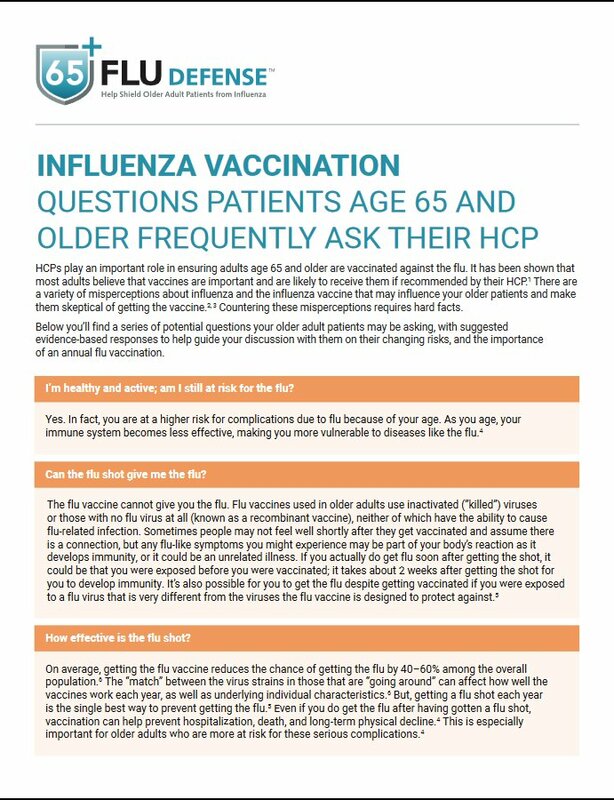 Although all the hard copies have been sold or distributed, IAC will provide a quote if you are interested in ordering a quantity of 200 copies or more (e-mail admininfo@immunize.org). There are now 796 organizations enrolled in IAC's Influenza Vaccination Honor Roll. The honor roll recognizes hospitals, medical practices, professional organizations, health departments, and government entities that have taken a stand for patient safety by implementing mandatory influenza vaccination policies for healthcare personnel. Since October 24, when IAC Express last reported on the Influenza Vaccination Honor Roll, six additional healthcare organizations have been enrolled. IAC urges qualifying healthcare organizations to apply by visiting the Application page. The Science Rap Academy is a class taught at The Nueva School in Hillsborough, California, where middle school students can research, write, record, shoot, and edit parody music videos about science. Last year, the students produced an excellent parody of the song "My Shot" from the hit musical Hamilton, in which they explored the safety and efficacy of vaccines. If you haven't already watched this short musical video, take a look and then share with your patients, colleagues, and friends! Watch My Shot (Vaccine Version). IAC recently updated Standing Orders for Administering Pneumococcal Conjugate Vaccine to Children as well as Standing Orders for Administering Inactivated Poliovirus Vaccine to Children and Teens. On November 1, CDC published the 2018 National Viral Hepatitis Progress Report, which is the annual update to the 2017 inaugural report titled Progress Toward Viral Hepatitis Elimination in the United States. In this report, CDC provides information on progress in the implementation of recommended interventions and the impact these interventions are having on prevention of viral hepatitis transmission, disease, and associated mortality. Portions of the report are published below. The seven indicators and accompanying 2020 goals compiled specifically for the National Progress Report were adapted from other initiatives, including Healthy People 2020, HHS’s National Viral Hepatitis Action Plan, 2017–2020 (PDF—84 pages), and CDC’s Viral Hepatitis Strategic Plan, 2016–2020 (PDF—17 pages). Hepatitis A vaccination coverage has increased, but not enough to meet the annual target. The large increase in the hepatitis A incidence rate for 2016 highlights the importance of vaccination as well as public health surveillance to identify and respond to outbreaks of hepatitis A. The incidence of acute hepatitis B among adults increased from 2014 through 2015, and then decreased slightly from 2015 through 2016, but not enough to meet the annual goal. Furthermore, newborn hepatitis B vaccination coverage declined in 2016, when almost 30% of newborns did not receive hepatitis B vaccination within 3 days of birth, leaving these young children unnecessarily vulnerable to hepatitis B virus infection. Of great concern are the ongoing and apparent large increases in the incidence of reported acute hepatitis C. The lack of a hepatitis C vaccine and increases in injection-drug use related to the nation’s opioid crisis have contributed to these increases in acute hepatitis C. Efforts to curb hepatitis C virus (HCV) transmission and identify all new (acute) and existing (chronic) infections must continue, especially since well-tolerated, short-course treatments are available that can cure almost all HCV-infected persons. The nation has made progress towards reducing deaths related to hepatitis B and hepatitis C, and the 2016 annual targets were met for both mortality indicators. Access the online report: 2018 National Viral Hepatitis Progress Report. HPV vaccination provides a compelling opportunity to prevent six cancers and other diseases, but vaccine uptake in the United States and many other countries is too low to achieve its cancer prevention potential. In its 2012–2013 report, the President’s Cancer Panel concluded that underuse of HPV vaccines was a serious but correctable threat to progress against cancer. In this report, the Panel Chair provides an overview of progress made over the past five years and presents priorities and strategies to accelerate HPV vaccine uptake and eliminate the unnecessary burden of preventable HPV cancers. 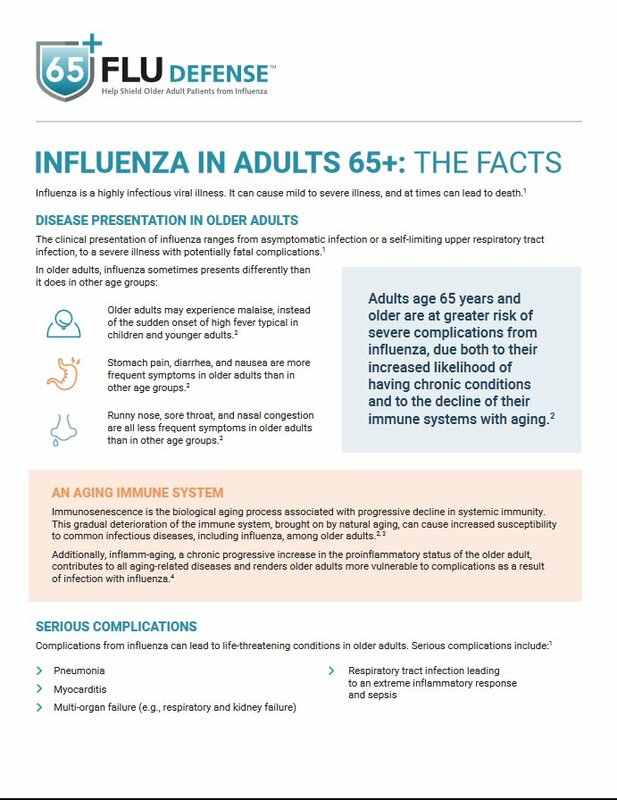 Be sure to check out the information and printable materials for your patients available on the 65+ Flu Defense website at www.influenza-defense.org and boost your efforts aimed at protecting this vulnerable population. 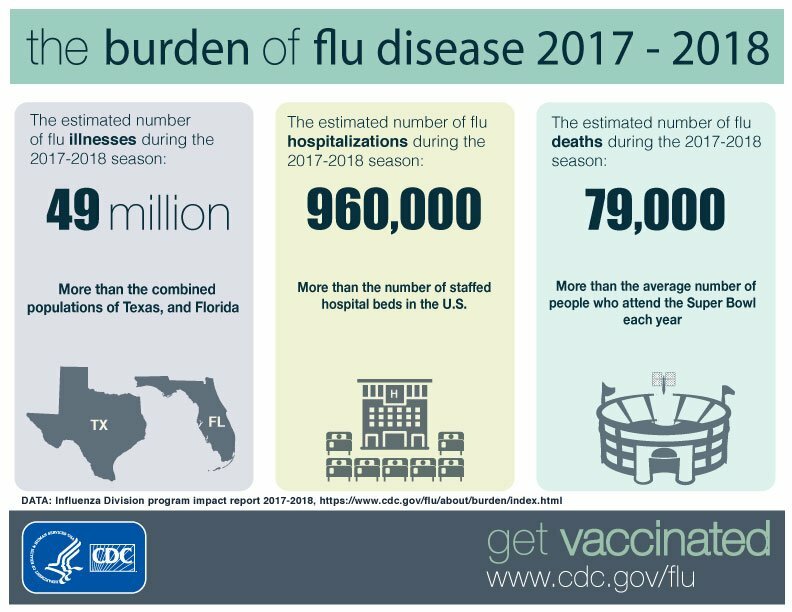 Influenza season is now under way, and CDC has reported three influenza-associated pediatric deaths. One pediatric death occurred during the 2018–2019 season and two occurred during the 2017–2018 season. Last season, there was a record-setting number of pediatric deaths in the U.S. (185), so be sure to protect all your patients for whom vaccination is recommended. CDC has stated in its Weekly U.S. Influenza Surveillance Report, FluView, that as of the week ending October 27, local influenza-like illness (ILI) has been reported in five states (Kentucky, Massachusetts, North Dakota, Oregon, and West Virginia), with sporadic ILI reported in 43 states and the District of Columbia, Puerto Rico, and the U.S. Virgin Islands. No ILI was reported for Mississippi and Virginia; Guam did not report. Influenza vaccination is recommended for everyone six months of age and older. If you don't provide influenza vaccination in your clinic, please recommend vaccination to your patients and refer them to a clinic or pharmacy that provides vaccines or to the HealthMap Vaccine Finder to locate sites near their workplaces or homes that offer influenza vaccination services. CDC maintains a page on Twitter called #HowIRecommend that includes informative videos for and by healthcare professionals about how to effectively recommend vaccines. A number of physicians provide practical and pithy advice on such situations as recommending influenza vaccine to pregnant women and children, and HPV vaccine to preteens, teens, and their parents. Take some time to view these videos on #HowIRecommend. You don't have to be a Twitter user to access this page. Dr. Zubin Damaria (also know as "ZDoggMD") recently interviewed Dr. Paul Offit (Children's Hospital of Philadelphia) in a 70-minute video about the dangers of celebrity health advice. Dr. Damaria interviews Dr. Offit because, as he says, "Dr. Paul Offit is the most hated MD in the antivax world...which means he's our favorite doc EVER." Dr. Damaria is a UCSF/Stanford-trained internal medicine physician who has built a second career as an entertaining source of medical information and a satirist of the U.S. healthcare system. Dr. Offit is the director of the Vaccine Education Center at Children's Hospital of Philadelphia, and a well-known writer and speaker. Check out The Danger of Celebrity Health Advice. CDC will present a Current Issues in Immunization NetConference on November 28 at 1:00 p.m. (ET). Immunization NetConferences are live, 1-hour presentations combining an online visual presentation with simultaneous audio via telephone conference call, plus a live question and answer session. On-demand replays and presentations will be available shortly after each event. This is a limited registration event. Registration is required. The Centers for Disease Control and Prevention (CDC) is actively investigating acute flaccid myelitis, or AFM, a serious condition that causes weakness in the arms or legs. From August 2014 through October 2018, CDC has received information on a total of 396 confirmed cases of AFM across the U.S.; most of the cases have occurred in children. As of October 26, there are 72 confirmed cases of AFM so far in 2018. The patients’ symptoms have been most similar to complications of infection with certain viruses, including poliovirus, non-polio enteroviruses, adenoviruses, and West Nile virus. CDC has not confirmed the cause for the majority of these cases. During this COCA call, subject matter experts from CDC will highlight the importance of reporting cases to learn more about this condition and the process for reporting. They will also cover specimen collection and testing, and what CDC is doing for its AFM investigation. Free continuing education credits (CME, CNE, CEU, CECH, and CPE) will be available. Bookmark this page and then click on the link provided a few minutes before the webinar is scheduled to begin. CDC’s MMWR and Medscape have jointly introduced a new free continuing education (CE) activity that describes current recommendations from the Advisory Committee on Immunization Practices (ACIP) regarding CDC's recently published Prevention and Control of Seasonal Influenza with Vaccines: Recommendations of the ACIP—United States, 2018–19 Influenza Season. If you are not a registered user on Medscape, you can register for free or login without a password and get unlimited access to all continuing education activities and other Medscape features. This activity is intended for public health officials, family medicine practitioners, infectious disease clinicians, nurses, obstetrician-gynecologists, pediatricians, pharmacists, and other clinicians caring for patients for whom vaccination against influenza may be indicated. ​Access the course on Medscape by visiting CDC's Medscape CME Activity web page and scroll down to the first item: Prevention and Control of Seasonal Influenza With Vaccines: Recommendations of the ACIP—United States, 2018–19 Influenza Season. Free continuing education credits will be offered, and the event archive will be available later during the week of the event. Current Issues in Vaccines webinars are co-sponsored by the Children's Hospital of Philadelphia and the Pennsylvania Chapter of the American Academy of Pediatrics. Registration (required) is open now. New! IAC's 142-page book available for free download.